We would like to introduce our family run bullion and coins business as a place that offers you the best service, at the most competitive prices, with discreet and fully insured delivery. For more than 25 years our exceptional, value driven service has enabled us to build a client base of informed and satisfied customers around the world. The first incarnation of our store circa 1990. We have a rich and colourful history spanning more than a quarter century in the precious metal industry. We began working in the retail jewellery business in the 1980’s, within 6 months we managed a jewellery store, and by the end of the decade we had built up our own store and continued to expand. We moved from our humble beginnings in the jewellery market to the excitement of the gold rush, which introduced us to the gold and silver coins and bullion business. By 2010 we had launched our first Bullion & Coins website with a static pricing system. This worked well and, to cater to increased demand, in 2013 we invested in a state of the art transactional website, to really give our customers a great experience with competitive live pricing. Serving the whole of the UK and international clients, we have continued to develop, improve and build on our quality of service since then, creating a safe and secure environment to buy quality bullion and coins at the best price. Our website provides the opportunity for clients to view a vast range of bullion products and accessories as well as the facility for clients to track the price with the help of bespoke Charting functionality and price alerts. During these last 25 years, we have seen most things come and go. We have learnt a great deal about the jewellery, coin and bullion business having traded daily in these precious items. The single best way to find out about this business has been learning on the job. Experience is everything. Fortunately, we have had some good teachers including many colleagues from around the world who have added to our breadth of knowledge and experience. There is no doubt that due to our experience in the gold and silver business we feel able to point you in the right direction when you wish to make an investment. You need to decide if Gold and Silver might be for you, but we as a business can help you find the right products to suit your requirements. There are many things to consider when making a purchase of gold and silver bullion or even when choosing a beautiful gift. We are here to share everything we have learnt over the years to make sure you get the relevant advice, the very best service, and fantastic value for money. 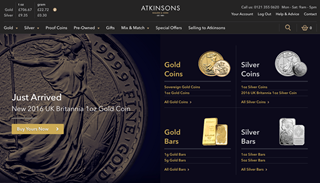 At Atkinsons, we not only cater for the individual private investor but also corporate clients looking to hold gold and silver as part of their portfolios. There can be many advantages to small and medium companies in holding physical bullion rather than cash at the bank earning little or no interest. 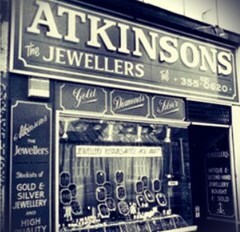 Please call our experienced and friendly team at Atkinsons to discuss your requirements and we will offer a discreet, impartial and bespoke recommendation. Please contact us at info@atkinsonsbullion.com or on 0121 355 0620 for any information or advice we might be able to provide.